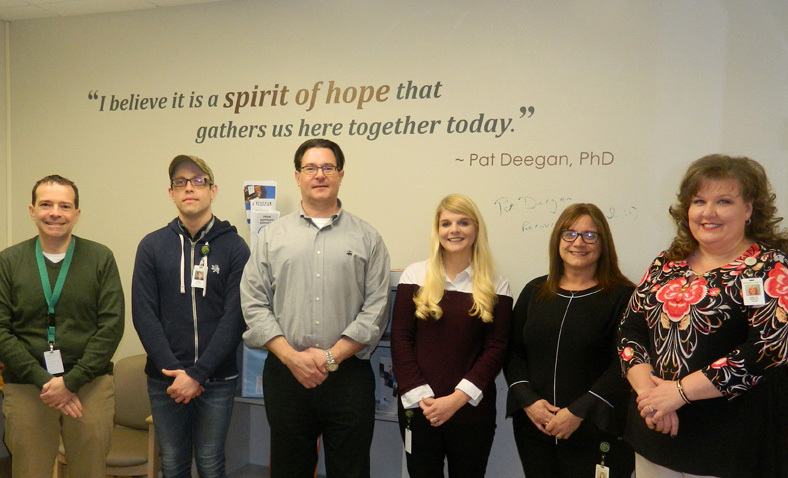 Dickinson Center Observes Decision Support Center’s One-Year Anniversary — Dickinson Center, Inc.
(Pictured left to right): Jim Prosper Operation Director, West Leithner DSC Peer Staff, Nils Magnusson Nurse Practitioner, Julie Papa DSC Coordinator/Supervisor, Tracey Williams Program Director, and Ginette La Strapes Outpatient Business Director. RIDGWAY — The Decision Support Center (DSC) located in the Ridgway Outpatient Clinic at Dickinson Center, Inc. (DCI) is celebrating its one-year anniversary. The program was developed to enable eligible individuals to meet with a Decision Support Peer Staff prior to their medication appointment with their prescriber. Founded by Pat Deegan, PhD & Associates, LLC, the DSC is managed through a web-based application known as “CommonGround”. DSC services are funded by Community Care Behavioral Health Organization. CommonGround and other services support consumers with their treatment and recovery. Get support for self-advocacy and shared decision making. As part of the anniversary celebration, the DSC team offered free donuts and refreshments to consumers.